I solved it by finding a hidden pair (12) in one of the rows and then a hidden quadruplet (2345) in one of the columns (I think). * If you have a square which you know is either 1 or 2, and somewhere else in the row/column there is an X < Y, then Y cannot be 2 - otherwise it would force X to be 1 and there would be no possibilities left for the first square. The same thing works with other consecutive numbers, and not just pairs either! * If you have X < Y > Z in the same row or column then Y cannot be 2, as it would force X and Z to both be 1. In general, Y must be at least 2 greater than both X and Z. The same sort of thing works with X > Y < Z and longer chains of inequalities. Yes, Pseudo, I found those too,eventually! But it wasn't an easy one, partly with the difficulty of looking up/down columns, left/right rows in a grid that seems much larger than the standard 9x9 suduko!! The important square is the shaded one. 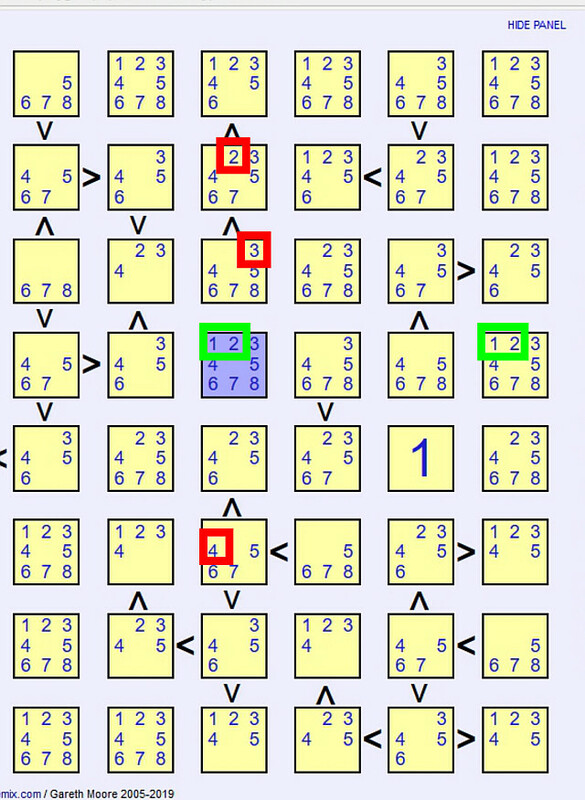 Hidden pair: In row 4, the two green boxes show that only 1 and 2 are possible, because they are nowhere else in this row. This is why the shaded square has to be 1 or 2 (making the square above the 8). All the numbers in red squares can be eliminated, because if those were correct, the > relations would force the smaller squares to have 1 AND 2 in them - nothing left for the shaded square. - Third row, first shown square (678): No 5 here, because the two lower than-sqares above and below can't be both 4. - Second square in this row (234): No 5, because the two adjacent greater than-squares can't be both 6. - Test question: second row, first square: what number can be eliminated? - Advanced test question: Two sqares below the 1 (second from the bottom, second from the right, containing 4567) - why can the 4 be eliminated? I just edited JoergWausW's comment to turn the link into a clickable link, but what an incredibly helpful comment - thanks! I know the tricks, there's just so much going on that I can't *find* what I need to use the tricks on. I get about this far and then to get any farther I just brute-force guess and check. purrs: In column 5 there's only one square where the 8 can be. If there are no starting numbers given, then the first numbers you're going to be able to solve will be 1 or N (where N is 8 in this puzzle). So for the first few minutes all you need to do is scan across rows and columns trying to solve for those two numbers. I don't leave squares without clues blank - because I "fortget" that they contain all numbers, especially if there is only one blank square in a row or column. In Pseudos Screenshot I might accidentally put the 8 in 5th column 3rd row, because I don't see any other 8 in that column. That will turn out to be correct in the end, but shouldn't happen at this point. On the other hand in this version it is easier to spot the hidden pair in 4th row. And it saves a little bit of time. So in the end it's everyone's own choice whether to leave those squares empty or not.